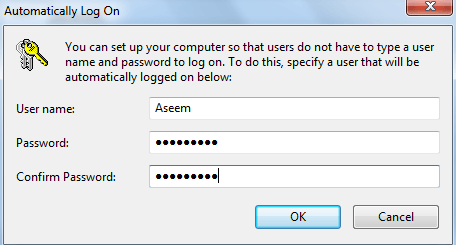 Want to automatically log into your Windows 7 computer without typing a password? 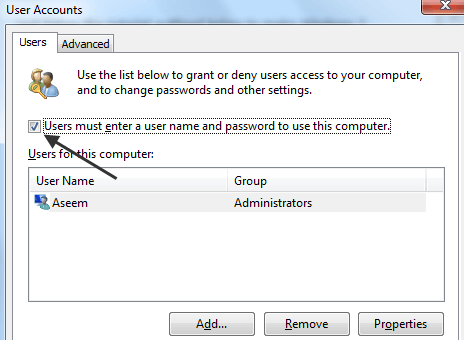 In earlier versions of Windows, you had to remove the password associated with your account in order to login without any prompts. In this article, I’ll explain how to set this up for a computer at home and for a computer that is joined to a domain. If you’re on a domain, you have to hack the registry a little to get it to work. in the run dialog box. Either way, you’ll get the same dialog box. When you uncheck it and click OK, you will be prompted to enter your current password for the currently logged-in user account. That’s it! Now restart your computer and you should be good to go. No more having to type in a password or having to click on one of those user icons. You’ll just be automatically logged into Windows 7. If you are joined to a domain, you would follow the same steps, but you’ll quickly realize that the checkbox option is missing altogether! So how do you get it back? With a registry tweak. As you can see, the value should be set to 1. If it’s 0, the checkbox will not appear. Go ahead and change the value to 1 and restart your computer. Now open the dialog box and you should see the checkbox. However, it might be unchecked. So you have to check the box, click OK and then go back into the dialog box and then uncheck it again. At this point, it’ll ask you for your login credentials and you should be good to go. Extra Tip: If the above method for auto-login for Windows 7 domain didn’t work, you can try to get the auto-login to work by tweaking three more values in the same registry location mentioned above. Set the keys to their appropriate values and restart your computer. This used to be the method to get a Windows XP computer joined to a domain to login automatically, but you can still use it for Windows 7! Enjoy!